Blog / And Now For Something Completely Different: TRINUS Helps Young Cancer Patient through Make-A-Wish. I don’t like to talk-up the activities of TRINUS in these weekly articles; I’m sure you receive enough corporate advertisements, self-promotion, and flag-waving during your day. But we were honoured to be part of a special event that we held in our office last week – and I want to make an exception and tell you about it. Through happenstance, we were put in touch with the Make-A-Wish Foundation of Northern Alberta. I’m sure most of you know that Make-A-Wish grants “wishes” to children with serious ailments, who are receiving treatment. Some of their stories are heart-wrenching; often involving invasive surgeries and years of treatments with chemotherapy and radiation. If anyone deserves a break from this nightmare, it’s these kids – and their parents. Make-A-Wish are very diligent in discovering the true desires of these young patients and go out of their way to grant them. One of their recipients – Logan – wanted a gaming computer and Make-a-Wish contacted us to see if we could help. Logan is an unassuming, quiet 17-year-old, who loves snowboarding, drawing, and computer gaming. But according to his mom Lisa, he’s also a fighter and is determined that cancer will not get the better of him. He is coming to the end of his 2-year treatment ordeal. What an opportunity for us. Without delving into the technical details, we were able to evaluate Logan’s Tech specifications, add a little expertise of our own, and gather together all of the required parts. It would have been a simple matter to assemble the components and test the computer; delivering a finished product to Logan with a handshake and a brief photo-op. DONE DEAL. But, some minds at TRINUS thought we could do more. Our Marketing Supervisor Chris – working with the Directors – put together a full TRINUS Day for Logan. We thought we could have Logan assist with building the computer from the various components, install the software and his favourite games, and optimize the computer for maximum performance; a true Gaming Powerhouse. The proof would be in playing some computer games. We wanted to add some special touches, so we had Sheri from NWT Promotions – our promotional products’ supplier – arrange for a special graphic design based on Logan’s favourite game, Overwatch. Darrel and Cheryl from Fine Line Industries – who wrap our vans – agreed to wrap the case with the graphic. Finally, we alerted Robert Bailey from Stony Plain about the project. For those not familiar with Robert, he is a world-class artist, who has worked with George Lucas and Disney on Star Wars, and is licensed by Marvel to draw their characters. Specializing in pencil drawings, Robert would do a specially-commissioned artwork for Logan. Devon and Andrew from SAVIAN – our website developers and social media consultants – arranged to record the event in time-lapse video, and Emily – a former marketing employee – agreed to take some pictures of the event. Well, it all came together last Wednesday, when Logan and his mom Lisa, accompanied by Jen and Aissa from Make-a-Wish, visited TRINUS. 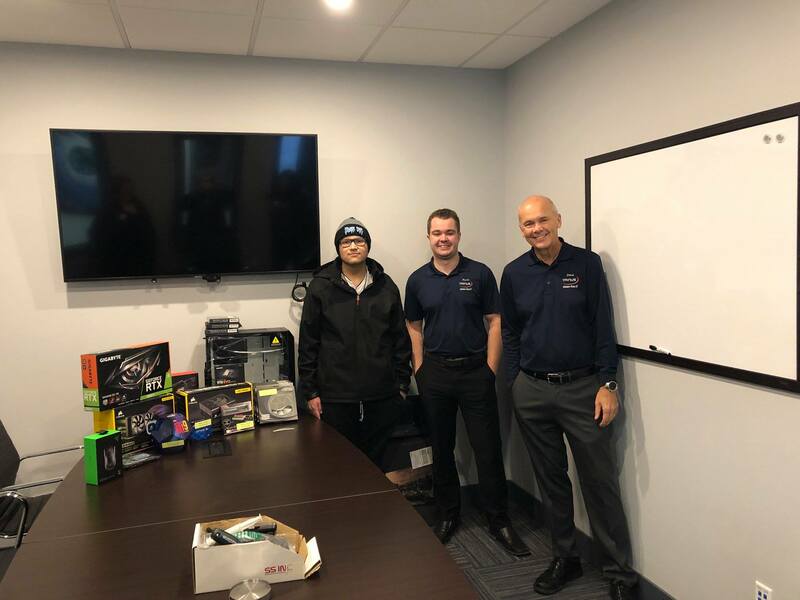 Kevin – our Director of Operations – spent the day with Logan, leading him through the computer-building process; Kevin is a long-time gaming computer Guru. All of our staff had pizza with Logan and we were able to make a few special presentations of Steam gift cards (to download his favourite games) and personally-branded TRINUS shirts. Robert’s pencil drawing of Batman (Logan’s favourite comic-book character) and the Joker was a huge hit. My wife Lena was at the office and she spent time with Lisa, Jen, and Aissa. It’s not often that we find an opportunity to make an impact in someone’s life that doesn’t involve a corporate computer network or someone engaging our professional services for a fee. Like most companies, we make charitable donations when and where we can. But aside from handing over some money or a gift, we’re often detached from the event and not sure if we actually made a difference. Make-a-Wish afforded us the opportunity to gather together the expertise from our staff and valued vendor-partners, to provide something to Logan that he wished for. We hope he has years of enjoyment from it, especially knowing he had a hand in building it. There were certainly some smiles when he started playing Overwatch on his new computer. And we did take a few pictures. I’ll break one of my rules and provide a link to our Facebook page so you can see for yourself. Why am I telling you all this? Twenty three years ago, Kevin was a recipient from Make-a-Wish. Lena and I know what a difference it made to our family.